Kevin Hart Interview On Oscars Outrage: 'We're All Flawed' Hart reflects on the controversial jokes from his past that led him to step down from hosting the Oscars. "Sometimes to grow as a comedian, you got to go through the stupid part," he says. 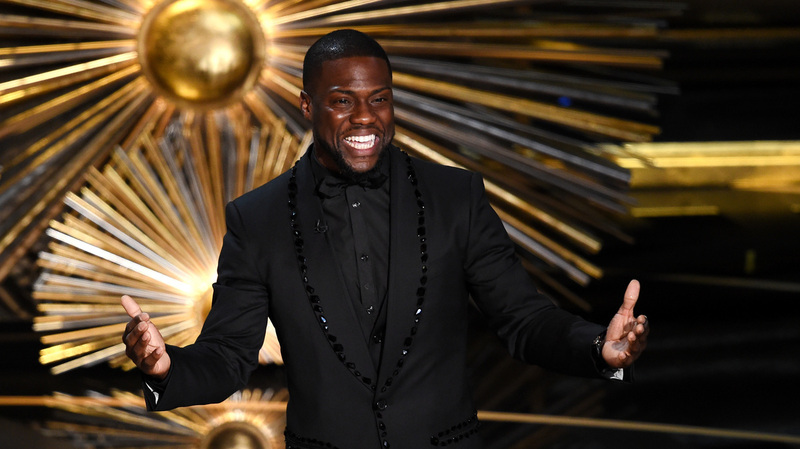 Actor and comedian Kevin Hart speaks onstage at the Academy Awards in 2016. Hart was slated to host the 2019 Oscars but withdrew after he was criticized for controversial jokes he made in 2010. For about 48 hours in December, Kevin Hart was slated to host the 2019 Academy Awards. Then Hart was called out for homophobic jokes and tweets he made in 2010, and the Academy asked him to apologize. Hart insisted that he already had apologized. Finally, after some back and forth, Hart stepped down from hosting, saying he didn't want to be a distraction. Sometimes to grow as a comedian, you got to go through the stupid part. Now, barely a month later, Hart says he's "over" the Oscars controversy. Nevertheless, he sat down for a long conversation with Fresh Air in which he reflected on the whirlwind of the past few weeks in the larger context of his comedy career. Hart notes that the jokes in question were made nearly a decade ago and that, at the time, they seemed in line with the risqué comedy he had grown up watching. But he adds he has a different perspective now. "The bad part about being a comedian is that sometimes you just aren't funny," he says. "Sometimes to grow as a comedian, you got to go through the stupid part." "Ultimately," Hart says, "I have 10 years of separation in between the time that was brought back up and now, and I think those 10 years acted as a great example of change. And in order for people to evolve, you have to accept their change." Hart plays the caretaker of a quadriplegic man (played by Bryan Cranston) in The Upside. Hart's new film, The Upside, represents a further evolution of his career. In it he plays Dell, a man who, trying to get his life back on track after serving prison time, gets a job as a caretaker for a wealthy quadriplegic man, played by Bryan Cranston. Hart describes his role as "something a little more serious." "You've seen me high-energy. You've seen me be the guy who's responsible for the funny," he says. "In this particular case, it was a little different. It was about me embracing the life of somebody that's real, and making sure that I gave a performance that made people invest in the relationship between the two characters." My apology was sincere when it was given, and I made it sincere when I gave it again, and my effort after that, when I gave another one, was just as sincere. But it just seemed as if it was a never-ending cycle. So I chose to just shut it down and say that I'm done with it, and move on from it. Well, it wasn't something that was talked about or seen. You have to understand, you're a product of your environment. So what you see is what you know. ... From my upbringing, it wasn't around. So the things that I was brought up on in the comedy that I watched, in the way that my dad talked and my cousins talked and my brother talk — that's all I know. So you're a product of that. Now, because my life took me in a different direction — I traveled. I travel the world. When you travel the world, you get to see things you never saw before. You get to see that other things exist, that other people exist. You get to be around all kinds of people. And when you go, and you experience different things, and different people, you become cultured. Your level of understanding and knowledge grows, to where now, you are aware of things that you may not have been aware of before. Because of that, you're able to adapt and you're able to change and take bad habits away. I think that my dad's vision and goal was for me to be a replica of him. I think that any man, when you have a child, your first will ... is for your child to be a version of you. You want them to have some cadences that you have. If your child chooses not to, if your child chooses to love or do anything else, that's fine. You're going to love your child regardless. You're not going to disown your kid. You're not going to hate your kid. You love your kid regardless. My dad loved me regardless, but my dad wanted to see me take on some of his loves and likes. He wanted to see me have some of his personality traits and characteristics. I was always a little scrappy kid, so I didn't have any worries when it came to that. I think the one thing that I always had was just confidence. My mother made sure that I understood who I was, and what my potential was, so I'd never felt like being short was a flaw. I mean, that's why I've always addressed it and talked about it. I've embraced it. It's not something that I feel like had a stigma behind it when I was coming up, "Like, Oh my God, I'm so small. People aren't going to like me. Oh God, I'm the smallest person here. I'm embarrassed." I've never had that. I never experienced that. I've always embraced it. [I talk about it onstage because] self-deprecation is always good. Say it before other people can. It's like, what state of the world do you want comedy to go to? Because ultimately, if we keep pushing in this direction, you're gonna have comics that don't know what's safe to talk about, and now the conversation has changed to people aren't funny anymore because everybody's afraid to be funny. So what level can they be funny? ... We're taking away the ability for people to be comfortable. Everybody. Workplace, work environments, from professional to any aspect of life, now. Everybody's walking on their toes. Everybody's walking on glass. Everybody is! I'm at a Vanity Fair party. It's a very true story. And [someone] says, "Don Rickles wants to meet you. He's a huge fan." I said, "Aw man, Don Rickles? Comedian legend. This man is unbelievable. He's just a legend just for who he is and what he's done for comedy." I go meet Don Rickles. Don Rickles, he sees me, gives me a hug, taps my cheek and said, "Look at you, you're like a cute little monkey." Don Rickles was always known for edgy, crazy material. He always said crazy things out of his mouth. At this moment, I say, "Wow. He just called me a monkey. Let me just get out of here. Let me just leave." Good meeting you, man. I don't want to sit here and tell people that Don Rickles just pissed me off. I'm just going to go and leave. It's very easy for me to leave. It's very easy for me to say at that moment, "Hey, this ain't for me. I'm out." There is no world where we shouldn't be able to laugh at ourselves. We're all flawed — flawed but funny. The world of a comedian is a real complicated world, and just understand where it started. If you were raised on comedy, that means you were raised on all the greats that came before you. When you look at the greats, when you look at George Carlin, when you look at Eddie Murphy, Richard Pryor ... the list goes on and on ... when you look at all these comedians, edgy was funny. Racy, cutting-edge was funny. Now, today, that's not funny. It's deemed "unfunny." So the change that comedians are having to make is one that they never thought they would have to do — that they never saw coming. And that change is going to be a change that takes time for every comedian to grasp and understand — some slower than others. I'm different. It took me nothing to adapt and change, but everybody's not going to get it. Everybody's not going to understand it. But you have to have patience ... for growth. You have to have patience. There is no world where we shouldn't be able to laugh at ourselves. We're all flawed — flawed but funny.